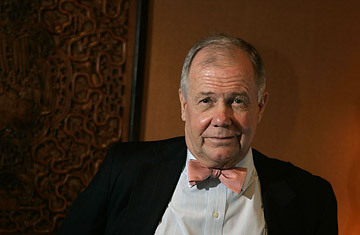 Jim Rogers became an investing legend in the 1970s while running a spectacularly successful hedge fund with George Soros. Since then, the Alabama native has traveled around the world more than once  on motorcycle and in a car  writing about his experiences, and his thoughts on investing, along the way. Last year, he moved to Singapore, to be close to the economic growth engine that is Asia, and also saw the launch of tradeable securities tied to a commodities index he created. TIME's Barbara Kiviat caught up with him by phone while he was on the road from Brussels to Amsterdam to ask him about what he makes of the state of the financial world today. You were one of the first to call the commodities boom. Now that prices have fallen, has your bullishness changed? No, no, not in the least. In the past 150 years or so, we've had eight or nine periods where there was forced liquidation of everything, with no regard to the fundamentals. Well, we're in one of those periods. In fact, what's happening now is improving the fundamentals of commodities. Farmers cannot even get loans for fertilizer. Certainly no one is going to get a loan to open a zinc mine. Supply is going down  this is very bullish. We have a decline in demand, but the world is in recession. We presume that is a business cycle. So if I wanted to make money in oil, how long would my time horizon have to be? I don't know whether you're going to have to wait six days, six months or six years before oil starts skyrocketing again. I covered a lot of my shorts [i.e., short positions] a couple of weeks ago and bought more commodities; I bought more agricultural commodities. I'm not a very good market timer, but I've been going back into the market. Ask me in a couple of years. What other commodities have you been buying? I only buy my indexes. I bought the agricultural index and I bought the general index. I think I'm going to make more money in agriculture than in other things for a while, but I'm not a very good market timer. I'm the world's worst trader. You're the world's worst trader? You used to run a hedge fund. Fine, but that doesn't mean I was a good trader. Whatever success I've had in investing has been by finding things that are cheap, buying them and owning them for years. I don't sit around trading. Brokers don't particularly like me. You own the Swiss franc. With the bailout of Swiss investment bank UBS, how does that change your calculus? The only thing the Swiss have had to sell for two hundred years has been the soundness of their currency. I, for the first time in my life, have started asking myself questions about the Swiss franc because of the UBS deal. It never occurred to me that the Swiss would do this [the bailout]. I have not started selling my Swiss francs. I have stopped buying them. I'm watching to see how it works out. How worried are you about the slowdown in China's GDP growth? I'm not worried at all. China could have a recession, it's not going to be the end of the story. In the 19th century, America had 15 depressions with a "d," a horrible civil war, we had very few human rights, we had no rule of law, we had regular massacres in the street. China will certainly have setbacks along the way. A lot of people think China can't have a recession. That's balderdash. China can have a recession like everybody else. Is it the end of the story? No. If it happens, you buy yourself some more China. What were the things that made you start shorting financials a couple of years ago? I could see that they were shams. There was no way Fannie Mae was producing 15% growth every quarter. They had giant derivatives positions, and they couldn't know what they were. I remember being on the telly, telling people that Fannie Mae was going to zero, and they'd say, What the hell are you talking about, that's Fannie Mae. Likewise with the investment banks. I used to sit there and say they're all going to eight [dollars per share]. It was clear that there were 29-year-olds on Wall Street sitting around making $10 million and thinking this was normal. I've been experienced enough to know that this is not reality. I'm still short the investment banks. Can you quantify how much money you made from those positions? That's a wonderful question, but you know I'm not going to answer it. I grew up in Demopolis, Alabama, where my parents and grandparents taught me you don't ever talk about how much money you have or how much things cost or how much you make. My grandparents would roll over in their poor graves if they heard me talking like that. What do you make of the global financial crisis more broadly? Do you think there's still another shoe to drop? Well, it's not over. It's going to be the worst economic time since the second World War, and that's because we had the worst excesses since the second World War. Certainly in the financial community what the governments are doing  they're making mistakes. In 1929 we had the stock market bubble pop, which was leading to a recession, but then the politicians all over the world made a lot of mistakes and turned what should have been a normal recession into a depression. I see the politicians making mistakes now, which may turn this into much much worse than it should be. The Federal Reserve and Treasury have more than doubled the American debt in the past three months. You and I are going to have to pay this off someday, and it's staggering. You're not concerned about systemic risk? That if they hadn't taken the steps they did, things might be much worse? When Lehman Brothers calls up [Treasury Secretary Hank] Paulson, what do you expect them to say? "Gosh, I got to worry about my Maserati or my plane payments?" No. They call up and shriek about systemic risk. Come on. Investment banks have been going bankrupt for hundreds of years and the world has still somehow survived. This approach has never worked. This is what the Japanese did in the 1990s. They refused to let anyone fail. And they had zombie banks and zombie companies. The way the system is supposed to work is when we have bad times, the assets moves from the incompetent to the competent, and then the competent start with renewed strength and the system rebuilds itself. A lot of very sophisticated investors have lost a lot of money in this market. What is the ordinary investor supposed to do? They should only be investing in things they themselves know a lot about. They shouldn't be listening to me or anybody else. If you know a lot about cars or fashion or something you should find great investments in that field. You're know a lot more about it than any Wall Streeter or hedge fund manager, because that's your passion. So people should follow your advice about commodities only if they're farmers? We all know about cotton. None of us had a clue what a dot-com was, but we all know what orange juice is. Before you go to work every morning, you use cotton and wool and silk and rubber and rice and wheat and corn and orange juice and coffee and sugar. Nobody can understand IBM. The chairman of the board of IBM can never understand IBM completely. It's got hundreds of thousands of employees. All you've got to do with cotton is figure out if there's too much or too little. That is not easy to do, but it is a lot simpler than understanding IBM or Toyota. Are you riding a motorcycle much these days? No, you break my heart. I haven't ridden a motorcycle in 10 years. If I had a bike now, I would take my little girls riding. But I've just been doing other things.